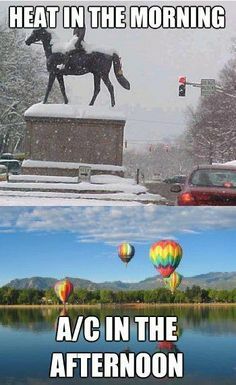 It’s that crazy time of year in Colorado. One day you have the heater on and the next day it’s the air conditioner. Colorado can have temperature fluctuations sometimes over 50 degrees! One day it’s 70 degrees and the next it’s 30 degrees! 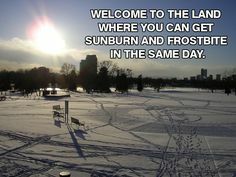 Yesterday it snowed in the morning and by noon the Sun had made her presence known and melted almost all the snow away. Like it never happened! This is part of the reason we all love Colorado so much. 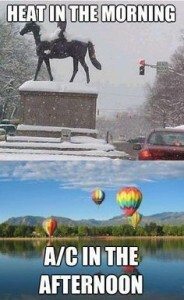 Our motto is, “If you don’t like the weather in Colorado just wait five minutes, it will change”! Window film can greatly affect the way the sun affects YOU and your loved ones in your Home, at Work and in your Automobile! Let’s see why, shall we…. First, in your home and/or office, window film can help regulate the temperatures so you don’t have to keep switching back and forth between heating and air conditioning. Window film helps reduce radiant heat flow to keep hot air OUT in the summer months. This will also help your air conditioner run more efficiently. On the flip side, window film can help to keep hot air IN during the Winter months. Window film acts as an insulate to the glass. When your heater is trying to find the cold spot in the room the window that is now covered with window film is no longer the cold spot. Applying window film will help lower your energy costs year round. Second, UV protection. In the Winter months people tend to forget about sunscreen. It’s cold outside so most people don’t associate sun damage with cold weather. Most people stay inside in the colder months leading them to believe sun exposure is not an issue. With over 300 days of sunshine in Colorado and our mile high altitude, we need to reprogram that mind set. Exposure to the sun is happening all around you even in the Winter months, even when it’s cloudy outside and even when you are inside! While you’re driving to work, sitting next to the window at lunch or soaking up the sunshine at home in your recliner reading your favorite book. UVA rays can penetrate through glass and are harmful to your skin. You are at just as much risk of being diagnosed with Skin Cancer in the snowy mountains as you are on the sandy beach! Did you know that in the Winter months in Colorado sun exposure can be just as dangerous, if not more, than it is in the summer months. The snow reflects up to 80% (SkinCancer.org) of UV light from the Sun. Which means you are getting hit by the same UV rays TWICE! Most window films will reduce over 99% of UVA and UVB rays. Helping protect you even when you are indoors! There is no doubt that without the sun, life would not exist. Plants and animals depend on the sun to survive. Humans depend on plants and animals to survive. It is the circle of life. We all need a little sunshine in our lives. Vitamin D is one of the main reasons we need the sun. Vitamin D helps promote healthy bones and teeth. There is a difference between outdoor sun exposure and indoor sun exposure. When we are outdoors UVB rays are triggering the Vitamin D production in our bodies. When we are indoors, clear glass blocks UVB rays but NOT UVA rays. This means your body is exposed to the more damaging UV rays without the normal protective benefit of Vitamin D production. Window film can help reduce over 99% of UVA rays. Sun damage affects can occur over time. You may not notice until it is too late. Start taking the proper precautions now to help prevent in the future! Give AAWT a call , we are here to help!